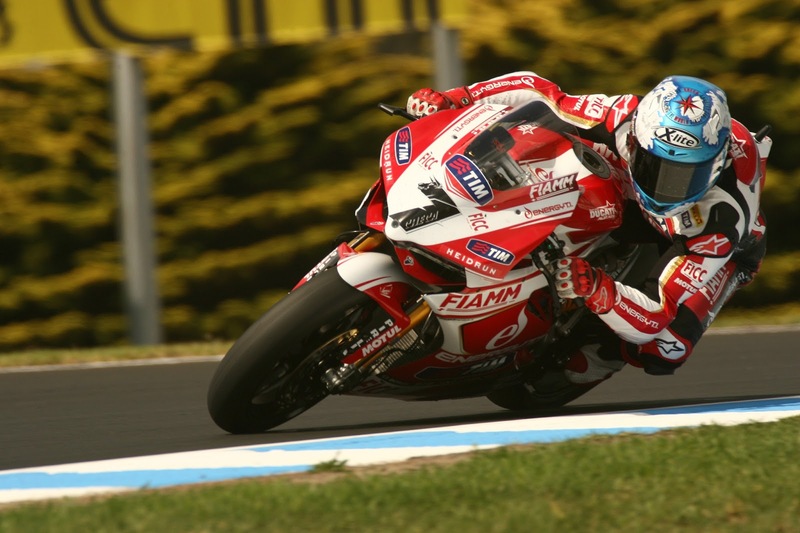 Alstare’s Carlos Checa will miss the second race at Phillip Island after being knocked unconscious in an unfortunate injury with Goldbet BMW’s Marco Melandri. Checa, looking up the inside of the Italian on lap 13 realised he was not going to make it just a little too late as he collided with Melandri’s back wheel, sending the Italian to the floor and the Spaniard into the air. Checa came down hard and was knocked unconscious with Melandri immediately running to see if the Alstare Ducati rider was OK. Checa was taken straight to the medical centre and reports have suggested the Spaniard is OK, however has no memory of the crash. He has been flown to hospital in Melbourne for further check-ups, therefore will obviously miss the second race. Alstare’s luck could not have got much worse during their week at Phillip Island, both Checa and team mate Badovini had been in hospital during testing, the Spaniard suffering from a stomach bug and the Italian falling hard during private tests, setting alight his new 1199 Panigale RS. Both Checa and Badovini fell in the opening practice session on Friday, Checa claiming he was “lucky not to break anything after one of biggest highsides of my career“. It was announced on Saturday that Italian rider Badovini would not ride due to a break in his foot. Things had started to look up after Checa stormed to pole position on Saturday, however it would seem the Gods had different ideas. Check our Twitter, @PaddockChatter for updates on Checa’s condition.